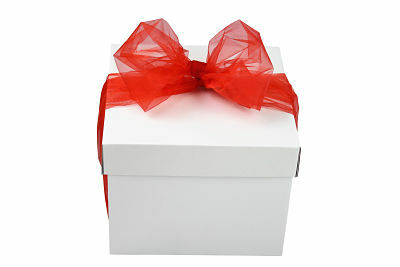 The Bath and Facial Gift Box, provides a luxurious box of lotions. Invigorating skin products and bath bubbles with delightful scents. Revitalising shampoo and nourishing conditioner pampering you from head to toe. From the superb range of H2k of Harrogate products, we have a included the Mischief bath and shower gel to accompany the Mischief hand and body lotion, into the Bath and Facial Gift Box. Enriched with eucalyptus and frankincense, the invigorating Mischief products provide a delightful scent, and rejuvenate both the skin and mind. Frankincense is widely used for its incredible anti-ageing properties and provides the ability to improve tone and texture of skin. We have also included the delightful Oilovme facial products which provides the ultimate in hydration and a healthy looking glow to your skin. Infused with the wonderfully beneficial Kalahari melon seed oil, rich in omega 6 fatty acids providing intense nourishment and reconstructing properties for skin. The Oilovme range provides cell regeneration and skin barrier repair and function, strengthening the skin and restoring elasticity for more supple skin. And finally to finish this bath and facial gift we have included the Spa Lifestyle luxurious shampoo and conditioner, to revitalise and nourish your hair, making you feel pampered from head to toe and as if you just stepped out of the Spa. Presented in a cream lidded cardboard box. Our delivery service to you. We offer delivery to all of the United Kingdom. Our current policy is to deliver directly to the recipient to obtain a signature upon receipt. If the recipient is not home the courier will attempt to deliver to a neighbour or to leave in a safe place. If you would like the gift leaving in a particular safe location or with a particular neighbour, please advise us in the delivery notes upon checkout. We request a contact number for the recipient in case we or ParcelForce have a problem finding the address. We offer delivery notifications and tracking information and usually add the purchaser’s email address to this notification to avoid spoiling any surprises. However if you would like us to notify the recipient the gift is on its way please enter their information into the delivery notes. Additional services are available at checkout. Yes, you can choose your preferred delivery date from our calendar during checkout. However please note this is not a guaranteed service and delays can occasionally occur beyond our control. Deliveries to remote areas ie, Scotland (Highlands & remote areas), Ireland (Northern & Republic) and all UK Islands will take longer to arrive. Please allow an extra 1-2 days. Gifts containing cheese can only be delivered Tuesday to Saturday to keep as fresh as possible. Do you deliver on a weekend? Yes, we are able to offer Saturday delivery. Please select this option at checkout. This is an all day service and specific AM/PM slots cannot be requested. The Tea Time Treats Gift Basket is the perfect excuse to stop for a cuppa. Filled full of your favourite cakes, muffins and biscuits to go with a perfect cup of your favourite brew. Share with friends for natter or savour the delights for a special afternoon treat. Sit back and enjoy a delicious chilled glass of white wine from around the world with our splendid white wine collection. Simply select 3 wines from our collection then let your imagination do the rest! 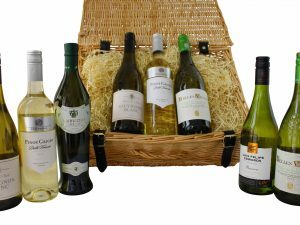 Whether your sending The Couple’s Mischief Luxury Gift Hamper Basket, as a gift for a special occasion or just wanting to spend some luxury time with your other half, then this is the perfect basket for you. 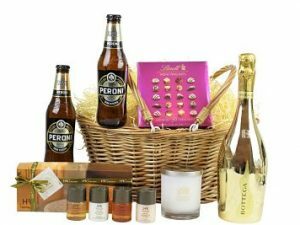 Prosecco, beer chocolates, candles and a pampering beauty gift! A fantastic indulgent experience, just remember to share! 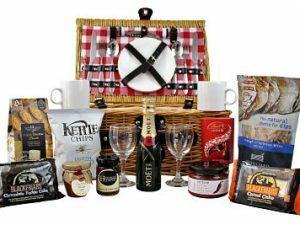 Belgravia Picnic Food Hamper for Two. Everything you need to enjoy a luxurious picnic. A delicious selection of Award Winning food and drink to make your basket complete. Handmade Hamper review. Ordering from Australia... Janine Fitzpatrick 5 &star;Trustpilot review. © 2015-2019 Handmade Hampers Ltd. All Rights Reserved.